Kirstin Erickson earned her B.A. in Biology from St. Olaf College and her M.A. and Ph.D. in Anthropology with a minor in Latin American History from the University of Wisconsin-Madison. 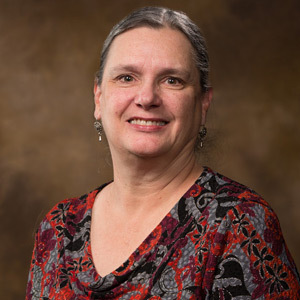 She has been a faculty member in the Department of Anthropology at the University of Arkansas since 2001 and served as the Director of Latin American and Latino Studies from 2013-2017. She teaches courses on the U.S.-Mexico Borderlands, Religion in Latin America, Museums and Material Culture, Native American Studies, Performance and Narrative, and Sociocultural Theory. Dr. Erickson has conducted research on both sides of the U.S.-Mexico border. Her first book, Yaqui Homeland and Homeplace: the Everyday Production of Ethnic Identity (published by the University of Arizona Press in 2008) is based on ethnographic fieldwork with northern Mexico’s Yaqui Tribe from 1996 through 2003. This book examines the ways in which gendered and ethnic identities articulate with Yaqui (Yoeme) history, memory, landscape narratives, and senses of place. Her current project focuses on Latino culture and identity in northern New Mexico, where she explores cultural production, notions of heritage, and the prominence of memory culture in this region’s Hispano communities. She conducts research with Hispana artists in Santa Fe and in the historically Hispano town of Chimayó, where she studies vernacular religion, arts activism, the organization of a community museum, and other self-representative practices. Her articles have been published in various journals, including the Journal of American Folklore, Western Folklore, The Journal of Folklore Research, and Anthropology and Humanism. Dr. Erickson grew up in Minnesota, Arizona, and Nevada, but she has also lived in Botswana (as a Peace Corps volunteer), Mexico (as an ethnographer), Wisconsin, Texas, and now Arkansas. She has been involved with the Fulbright Honors Program since her early years at the University of Arkansas. She has directed more than a dozen honors theses, served on the Honors Council, co-taught the Honors Humanities Project (H2P), and served as her department’s Honors Advisor and on numerous Honors Fellowship and study abroad committees. She believes in the potential of a liberal arts education to provide an enriching and holistic intellectual experience and to produce graduates who think critically, communicate well, and engage deeply with the world around them. She appreciates the opportunity to serve the Fulbright Honors Studies program and loves working with students who are intellectually adventuresome, who relish the process of learning, and who are willing to go the extra mile in pursuit of creative and scholarly excellence. Jill joined Fulbright Honors in January 2012 after 5 1/2 year of academic advising in the Fulbright Advising Center. While there she worked with students of all majors in Fulbright College. Jill was Assistant Director of Program Development and her responsibilities in addition to academic advising included heading the colleges recruiting efforts along with supervising the Fulbright College Ambassadors. 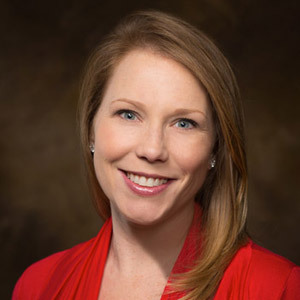 She is an active member of both the Arkansas Academic Advising Network (ArkANN) and National Academic Advising Counsel (NACADA) where she is the incoming chair of the Webinar Advisory Board. She has presented at the state, regional and national level through these two organizations. She was named "Outstanding Academic Adviser" by ArkAAN in 2010 and her co-presentation on student veterans won Best of Region 7. Prior to the Advising Center she was an Assistant Director of Admission in the University's Office of Admissions. A native of Brinkley, AR, Jill now calls Northwest Arkansas home with her husband Michael, their two little girls Emma and Ava and their fur baby Gabby. She loves to walk with her family around campus and gets excited about all things Razorback. Her favorite part of her job is that every student is different and each one of them brings something special to the advising session. Helping students discover their passions and how a Fulbright major fits them continues to make her smile daily. Mary Ellen was born in Delano, California, and grew up in Springfield, Missouri. Her parents are retired academicians from Missouri State University; Dr. Holt V. Spicer, former Debate Coach, Communication Department Chair, and Dean of the College of Arts and Humanities and Marion Spicer, English professor. Mary Ellen has a B.A. in Music from Missouri State University. She is married to Hershel Hartford and they have six children, Emily Heard, Rhiannon Strick, Jasmine Cloud, Malyssa Semcken, James Fry, and Gracie Hartford, and seven grandchildren. She enjoys singing, both at St. Paul's Episcopal Church and with the Symphony of Northwest Arkansas Singers. She has sung on tour several times, including singing solos in St. Peter's Basilica in Rome and St. Mark's Cathedral in Venice. She also loves to read and cook. Mary Ellen has been with the Fulbright College Honors Program for almost 13 years, and had been Administrative Secretary in the Department of Music at Missouri State University for five years before that. She also has extensive management experience from years in restaurants and convenience stores. She loves working with bright students and making them feel at home. Craig Pasquinzo grew up in Mena, Arkansas. After high school he attended the University of Arkansas in 1993. While attending the U of A, he focused on broadcast journalism during his undergraduate career. He worked in Carrollton, Texas as a television producer for 6 years, making corporate training videos and short documentary pieces primarily for the healthcare sector. In 2005 Craig started a branch of his family’s business in Northwest Arkansas and worked in that business till 2012. The lure of television production and education brought him back to the University of Arkansas in 2014 when he entered the Fulbright graduate program, focusing on documentary film. During the past two years he has completed two documentaries, worked as a graduate assistant for The TEXT (Tibetans in Exile Today) Program, and in the fall of 2016 completed his masters degree of arts. Craig is married to Hannah Pasquinzo and they have two children Max and Evie. He enjoys spending time with his family and supporting his children with their school activities. Craig likes the energy that the University of Arkansas brings to Northwest Arkansas and looks forward to helping students achieve success.